I woke up at 1. I was not feeling very good. Only 3 weeks were left in Kolkata, then back to home for a week and then again to Mumbai. I was feeling little homesick. I was not feeling to get up, I remain on bed listening to some music. Suddenly, I came across a blog in which there was a post called 50 New rules of work By Robin Sharma. One of the point was Do things which you don’t do normally, Talk to people you don’t talk normally, Read magazines, you don’t read, Go to places you don’t commonly visit. Disrupts your thinking so that it remains fresh. With this thought in mind, I planned a visit to famous science city. I checked out the site and note down all the relevant details. 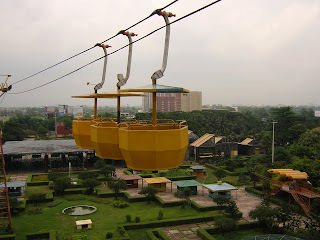 I also check the other stuff in Science city and one of the blog said, it will take minimum 3 hours. I thought, it’s a good place to spend the evening and as it remain open till 9 in the night. I planned to leave by 3.30 without worrying about the hot summer. I ordered a Chicken garlic Chowmein for lunch/breakfast. At 3, I went to take a bath. At 3:35, I hired a taxi. When you go to unknown place, You always remain scary about the driver whether he is following the longest route. At 4:15, he dropped me and charged 150. I was pretty satisfied with the bill. As I entered, I saw some out of the world buildings which were really giving it a look of Science city. After depositing my bag at cloak counter, I buy the entry ticket which cost around 25 bucks. I take a stroll around whole park. It was very huge, lot of families especially those with small kids had came there. Lovers didn’t even spare this place. They can be seen on the hidden benches. Now, I was tired and want to take a rest. I went to Space theatre. I purchased a ticket of rs. 50 bucks and went inside the theatre. It was almost full, only few rows were vacant in the front. It was looking like hemisphere. I take a seat in one of the row. Movie, was about to start. Guard came to me and asked sir if you are alone. I nodded. He told me, then go to last 2 seats, you will have a ultimate view. They were vacant perhaps nobody was there in a group of 2. Vow, the view was mesmerizing. You can assume it like the PVR, just the difference was screen was everywhere, front, top and both the sides and it was circular in shape. The movie started. Mystery of the Nile. We were feeling like we were sitting in an helicopter and it was moving over the river Nile. It was flying very fast and taking sharp turns. I became discomforted. Suddenly, people and kids began shouting. Now, I thought ohh, it must be some speciality of this Doom shaped theatre of which I was ignorant. My seat was at such a location that one can cover the maximum portion of the screen. I saw the people in the front rows, they were almost lying. I was comfortable. The only thing was helicopter was taking very sharp turns. And with each turn, people shouts. The kid sitting in front of me picture started crying and stand up on his chair thinking no was sitting behind him. My seat was at much more elevation. The top part in the was screen. I was sitting at the extreme back with at one of the seat of the 2 seats placed differently. I thought what had happened to the kid. His mother slap him and make him saw me ’She said, Don’t disturb uncle.’ I said, its all right auntie and kid is not disturbing me. I thought if I really look like an Uncle. Perhaps, yes, it was not the first time somebody had said me uncle. Movie ended. Now, it was a time to increase some knowledge. I started reading about the theatre on the walls. I came to know that the device used inside was Astrological projector. It is used to show the movies whose size is 5 times more than the normal movie. Size here was of course not referred to length. It was actually referring to the screen size, I guess. 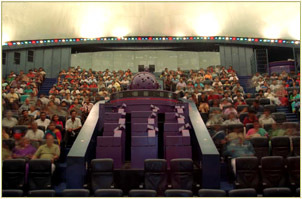 The unique proposition of this device was the audience feel them as a part of movie which I experienced just. Then, I went to another section. There were lot of machines kept inside the glass. It is written over there to press a switch if you want to see the experiment. All the experiments are clearly explained in a non technical language. I looked at many experiments. I remember my high school days. This place is a must for children. Many of my doubts that I had in childhood cleared today. One of the experiment was, as we press a button, bubble came out of the tube and began to rise. As, it was rising , its size increases which shows that pressure depend upon the height. As the bubble was rising, pressure was decreasing and it size was increasing. Wow. Another was showing that more than 12 images/ second was perceived as continuous motion. Yupp, Like moving fan. This is called as the persistence of vision. This was all is a part of space station but to watch, one doesn’t need extra ticket. I had enough of rest in Centralized AC space theatre. 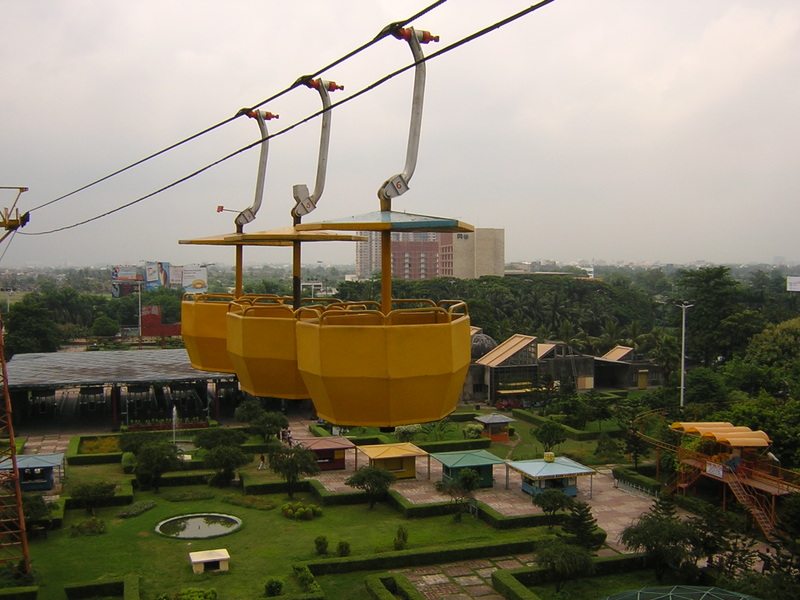 I came out and went to Cable car in which you can see the whole Science city from the top. It was truly a Science city. But, I came to know, this cable car will drop you out of the main entrance. Enjoy this ride at the end when you have completed all the other things. I went to see the Evolutionary park. Its ticket was of 10 bucks. As I entered, I was alone and it was quite dark showing the dinosaurs on both the sides. It was really scary. I began to wait for some other people to join but nobody came. After 2,3 minutes, I started all alone. This park show all the stages of evolution of men with various animals surrounding you on both the sides. Also, there were some very horrible sounds. This park was really a must watch for everybody. Once, I went similar to this park in Delhi, when I was a kid. The picture of my cousins and my relatives came in my mind. It took me 15 minutes to saw this park. It was so hot and humid inside. When I came out, I was literally sweating. It was also written over there, as temperature is not controlled in this park, please bear the inconvenience. I went again to Space theatre and purchased the ticket of 3D movie. It cost me 20 bucks. I went inside. It was a flop show. I dint like it all. It was for the small kids. I have looked almost all the important things in the Science city. The only thing I didn’t tried was the Time Machine. There were certain instructions like people with so and so problems shouldn’t try it. I was having neck and back pain. Although, these were not mentioned, I didn’t tried that. I thought I had enough. Now, its time to go back to cable car. I purchased a ticket worth 25. I asked him I want to sit alone in the cable and not with other people. He asked me to wait then. I waited for 10 minutes. Journey in the trolley was very nice experience. It just gave the look of whole city. One of thing , I had missed was musical fountains. The trolley stopped exactly over the musical fountains for 2 minutes. It was a wonderful experience, listening to music hanging in the air. With it, ended my Science city visit. I collected my Bag, catch a bus to Behala where I was living. The journey in the bus was very tiring. But, I had planned a dinner meal in Arsalan, lucknawi restaurant in Kolkata. It was bit expensive so in order to compensate, I had managed this part of my journey with bus. Finally, dinner was awesome. Lucknawi food is always good in serving mughlai cuisine. This restaurant was near my flat but I didn’t know about it before. How sad. It is good that still I have 3 weeks. My bill came out to be 240/-. But I was very much satisfied. I had 1 plate chicken, garlic naan, coldrink and 1 mutton Biryani. At last, I again take a taxi to home. This time taxi bill was 40. Overall, the day was good. 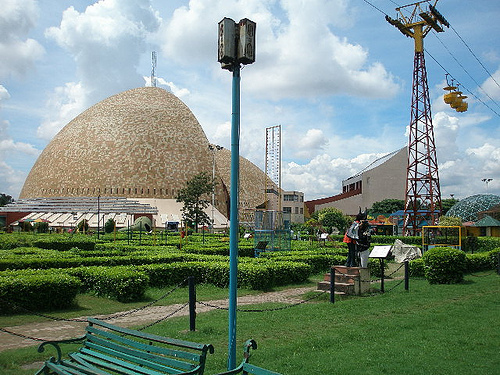 Science City is a must visit for everyone once. If you are a kid or have kids, then you will like to go there often. Why it took so long to publish the 1st post???? ?